Inexpensive, healthy, “stretchable,” dinners are what I am all about. I was tickled to come across this recipe one day when browsing Pinterest. I do admit, I was not a fan of stuffed peppers growing up, but have come to really like them as an adult. My kids let out the same moan that I did when they see stuffed peppers placed on the dinner table but that is OK – they are not going to like everything I make and it is a great way to combine veggies, protein and a healthy complex carbohydrate. 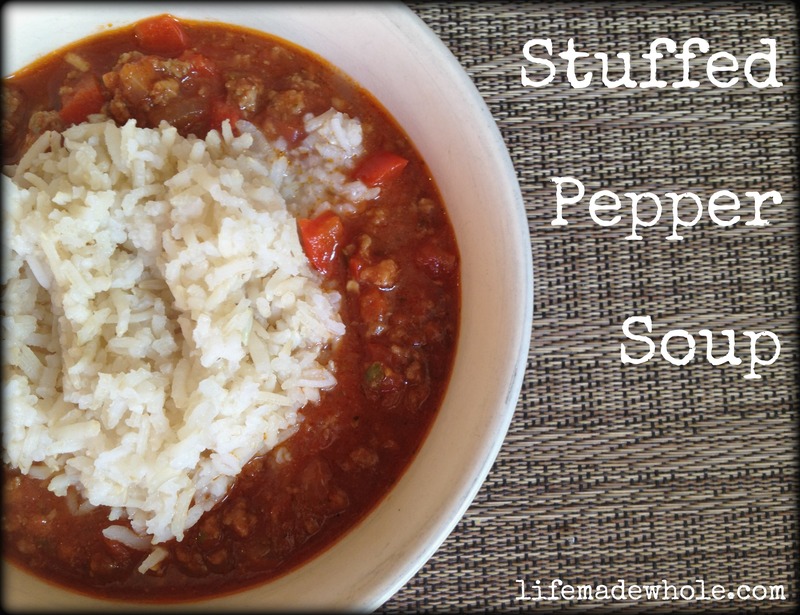 I was intrigued by this idea of creating a soup that would contain all the elements of the whole stuffed pepper, especially because it seemed less labor intensive (bonus!) The first time I made this soup, I followed the recipe very closely – just replacing the brown rice with brown basmati rice and I did not use lean ground beef, rather I used local grassfed ground beef which is higher in fat but it is a healthy fat (conventional raised cattle would not result in the same healthy fat.) Also, I was fortunate enough to have some homemade chicken stock available rather than boxed chicken broth. The second time I made this I made the same changes but omitted the chicken stock altogether. This was not intentional…I didn’t even catch my mistake until looking over the recipe later that evening as I considered adding it to my blog. It made sense though, I had thought that the soup seemed a lot thicker the second time around — more of a chili consistency. I liked it just as much without the chicken stock (or broth) and would consider making it that way again. However, adding chicken stock does help it to stretch further and gives it the true soup consistency. In large pot or dutch oven, brown ground meat and onion over medium-high heat. Add peppers and garlic. Reduce heat and cook for about 5 minutes. Add tomatoes, tomato sauce, chicken stock, marjoram and seasonings. Cover and simmer on low heat for 30 minutes. Serve in bowls and top with about 1/2 cup of brown rice. Enjoy. I fed 4 people with 1/2 of this recipe and froze the other half. Great to have in the freezer for a cold day! This entry was posted in Food and tagged easy dinner, gluten free, Grass fed, soup. Bookmark the permalink.